Our Volunteers are getting things ready for the 2018 Christmas Miracle Food Hamper Project! Each year we plan to deliver healthy food hampers and knitted hats and mitts for children to 50+ families in our community. We do this alongside the Christmas Bureau operated out of the House of Friendship Emergency Food Hamper Program and the community association. We are thankful for the continued support received from area schools, churches, businesses and individuals over the past 35 years. You make this project possible! $175.00 WILL PAY FOR A CHRISTMAS FOOD HAMPER FOR A SMALL FAMILY OF 4. 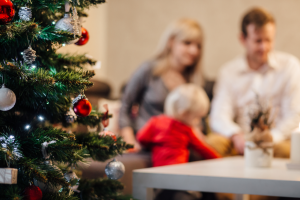 This helps the family cover extra expenses during the Christmas season. FINANCIAL DONATIONS ARE NEEDED! Donations received over $20.00 will receive an income tax receipt from the City of Kitchener. Please make your cheque payable to the “City of Kitchener”, and deliver it in an envelope addressed to DPPCA 150 Pioneer Drive, Kitchener ON N2P 2C2 to the Kitchener Public Library location at the Doon Pioneer Park Community during office hours. NON-PERISHABLE FOOD DONATIONS ARE ALWAYS APPRECIATED. Donate non-perishable items to our project up until Wednesday December 19th by dropping them off at participating centres, area schools, churches and other neighbourhood businesses. NEW KNITTED HATS AND MITTENS FOR CHILDREN ARE ALSO ACCEPTED. Most needed are for kids ages 9 – 14. The donation box for these will be at the Pioneer Park Library until Wednesday, December 12th. Send us an email, or call the community centre office to donate new/unused yarn’ or to find out how to pick up yarn for volunteer knitters. The “TOONIE FOR TINS Campaign” helps to pay for the perishable food items. This project is easy to organize for your club, class or family. If everyone donates $2.00, it helps to pay for the food purchases of the project. VOLUNTEERS CAN REGISTER BY EMAIL FROM SEPTEMBER 5TH UNTIL FRIDAY, DECEMBER 14TH. Registration is limited so sign yourself and your family up early! Join the CM Project Planning Committee! Deliver the hampers on Saturday, December 22nd at 10:30 am. Let us know if your group needs our help to organize their own food hamper project, sponsor a family or run a fundraising event or campaign to raise awareness of the Food Hamper Project in our community. FAMILIES IN NEED OF A FOOD HAMPER CAN REGISTER AT THE PIONEER PARK FOOD BANK IN NOVEMBER (Date to be determined) or by contacting the House of Friendship Food Hamper Program at 807 Guelph St, Kitchener, 519-742-5860 (www.christmasbureau.ca). ID for all members in your family, and income information will be required to register. GOT QUESTIONS? We can now be reached by Email: AnnualChristmasMiracleProject@gmail.com, or by telephone to the Community Centre (519) 748-2641 or to a Project Volunteer (519) 589-9637.